Running the Toronto Waterfront Marathon was always in the plan for this fall, and after running a not-awful 2:39 in Virginia Beach last March, I was ready to take another step forward in this tough event. Over the spring and summer I had planned to run a few more track races, but after some health issues due to an infected blister on my foot in May, I ended up shutting things down early. (Pro-tip, people: don’t drain your own blisters. I did and mine got infected, developed into cellulitis, and wrecked me pretty badly. 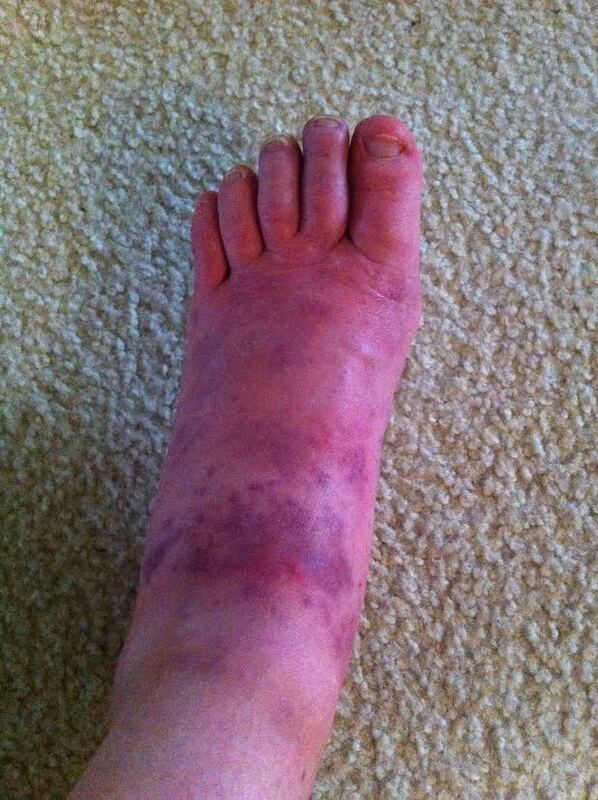 You don’t want your foot to look like this. Also you probably shouldn’t click on the link, it’s disgusting. I linked it instead of embedding it in the post for that reason. You’re welcome.) I took most of June to build up easy mileage, and added workouts and long runs in July. At the end of the month I went out to Quebec City to race the Quebec 10,000m Championships, hosted by Laval. I felt great during the race and ran 33:24, my second-fastest 10k ever. It was a nice confidence boost to run so close to my 10k personal best at the start of a marathon build. Steve and I decided not to deviate too much from the marathon training plan I followed leading up to Virginia Beach earlier in the year. The idea was that I could run a similar program, but be more consistent thanks to more favourable running weather (since winter training plans often go off the rails when the footing gets bad). I increased my volume slightly, hitting over 200k on all of my high weeks, but the basics were the same: lots of work at marathon pace, long runs at marathon pace plus 20-30 seconds per kilometer, and the odd tempo here and there. Throughout the build I was encouraged by the fact that I was nailing my workouts despite the increase in mileage. This has sometimes been a problem for me, but I felt great this time around. OK, my Springbank Half Marathon (it was supposed to be a marathon pace workout) was a bit of a mess, but that was my own fault for moving my long run too close to it to avoid a really hot few days during the previous week. And it was right after the Dragon Age Trespasser DLC came out, so I was stressed as all hell! Yes, a video game caused me serious emotional turmoil and ruined my workout, you read that right. Goddammit, Bioware. After Springbank, things really clicked. I rolled some solid workouts and long runs and was starting to feel pretty confident about my upcoming race. The rough goal I had in mind was a sub-2:35. In every marathon buildup my last big workout has been 26k at marathon pace, borrowed from the Brooks-Hansons group in the US. On October 1st I ran the workout averaging 3:40/km, right under 2:35 pace, and felt great. I was ready. I was ready. One taper later it was race weekend. Once I was in Toronto, my main pre-race mission was finding some company for the first half of the race. The slowest women’s pacer would be aiming for (Athletics Canada’s A+) Olympic standard pace of 2:29:50, which was too hot for me. I was thinking a 1:17:00 first half would be ideal, but I was willing to expand that to a range of 1:16:30 to 1:17:30 if it meant running with a pack. Surely, I thought, I could go to the technical meeting and find a few women who wanted to run somewhere in that range…right? Nope, I tried talking to people at the meeting and they weren’t giving me anything. I couldn’t tell if they were nervous, unsure, or just playing it close to the chest, but no one wanted to tell me what they had planned. Come on people, I know it’s a race and we are competitors, but it’s a freaking marathon! Let’s help each other out here, at least for the first half! After no success whatsoever, Strava came to my rescue. I remembered seeing that my Strava buddyRob Brouillette was running Toronto and aiming for around 2:34, so I messaged him and asked if he wanted to work together and hit halfway in 1:17. He agreed, so I told a few women what I planned to do and that they were welcome to join me if they were inclined (once again, getting nothing but blank stares and non-committal answers in response). I went to bed that night a little more confident, since I would have at least one person to run with. Race day arrived with near-perfect weather. It was cold, and I could barely feel any wind. We lined up, the gun went off, and I was able to find Rob within the first few hundred meters. We got on pace immediately and the legs felt great. Dan Way ran with us for a bit and I gave him a hard time for being far too chatty for a dude racing a half marathon. Sometime after 5k our group spread out a little and for a long time after that it was just Rob and I running side by side, passing or getting passed by folks running the half. On the west stretch of the Lakeshore I saw my dad with my sister, Alison and her partner, Will out cheering me on, so I gave them a big grin on the way out and a wave on the way back. Other than that, the first half was mostly uneventful. Off the start I had seen Lanni take off and Natasha Lebeaud and Tarah Korir running with Terrence Attema (who was pacing for Olympic standard). I figured I could run down Natasha and Tarah if they fell off pace, but it was far too early to worry about that. Rob and I focused in on hitting our splits, still running side by side and exchanging a few words every once in a while. Rob and I running together, close to the halfway mark. We hit the halfway mark in 1:16:34. I had a brief moment of panic as this was at the fast end of what I had wanted, but it was still within the range and my body felt great so I told my brain to shut up and gave Steve the thumbs up as I ran past. As we ran towards the turnaround on the north-south stretch along the Don River, I could see that I had closed the gap on Tarah and Natasha. By the 25k mark I had them in my sights and it took all of the self-restraint I had not to surge immediately to catch them. I still dropped my fastest 5k split of the race (18:02 by my watch) and passed both women by 30k to move up to second Canadian. Through 30k I knew I was having a great day, but it was still new territory for me. In my previous marathons I’d had something go wrong well before this point, so I didn’t know what it was like to get to 20 miles on pace and I had no clue what would happen after that. There was still the fear of that infamous last 10k…I could hit the wall, cramp up, or just slow down. Fortunately there were tons of spectators out watching the race in The Beaches, so I relied on the energy of the crowd to get me through that stretch. As I approached the final turnaround I started counting the women ahead of me. I was in ninth and I thought the woman in eighth looked rough, so I made it my mission to catch her. Around 32k Rob started to fall back, so we wished each other well and I got myself mentally ready for the solo grind to the finish. My legs were feeling tight and I was tired, but my splits were still right on and I took some confidence from that. I thought of the long runs I had done with marathon pace work at the end and told myself it was just like doing another run in Springbank Park. At 37k I moved up into 8th place and I finally let myself think: “yes, this is happening, you’ve got this.” I knew it was a great race and I could keep it going through to the finish. Then there was a stupid little hill at 39k and it nearly killed me. That was definitely the most painful part of the race. I slowed slightly over the last 2.2k and wow, the homestretch on Bay St. seemed to last an eternity, but I was excited as I crossed the line and gave a fist pump in celebration. My official time was 2:33:23, a personal best by over six minutes. OK readers, things are about to get real in here. This race was a huge personal triumph for me. As you may already know, the marathon has been a huge struggle. I thought it could be my best event because of how I’ve handled the training, but it took me a long time to put it together. I trained for my first marathon back in 2012 but got sick during my taper and dropped out of the race. In my second attempt, I got injured and didn’t even make it to the start line. Last year in Columbus I managed to finish the damn race, but it was a complete disaster and I finished in over 2:50. Virginia Beach served its purpose in bridging the gap between my blowup of a debut and what I wanted to run in Toronto this fall. And yet prior to this fall, I was 28 years old, I had trained for four marathons, and I only had a 2:39 to my name. 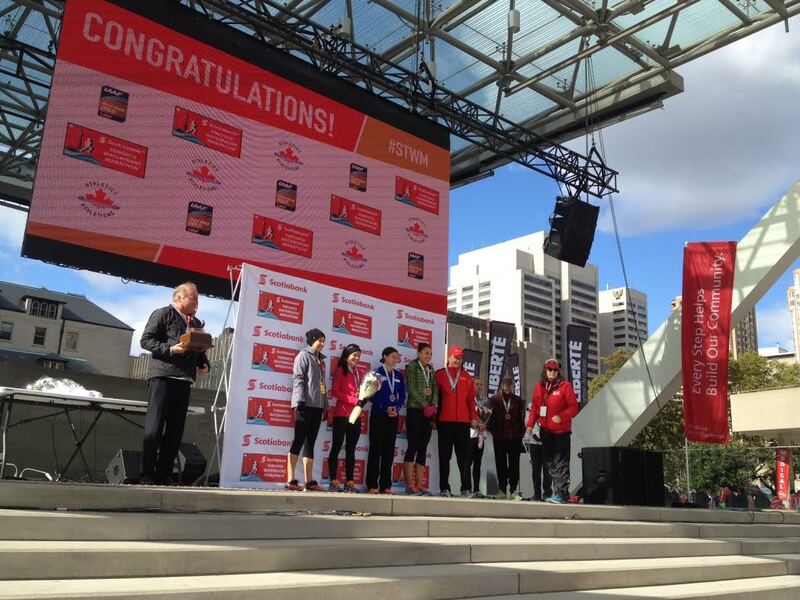 I had wanted to better 2:39 in my debut in Toronto three years ago. I was frustrated. I was questioning whether or not I was cut out for the marathon and wondering if I was wasting my time with this event. Last weekend, I finally got it right. My marathon buildup couldn’t have gone much better, and then perfect weather and a well-executed race let me run a time that reflected my fitness. I’m not sure if success makes previous failures any easier to swallow or if experiencing setbacks makes it even better when you finally achieve your goal. All I know is that I’m pretty damn happy now. It’s about time to wrap this thing up, so let’s get to the thank yous. A huge thanks to Rob Brouillette for the company on the course for 32k. It was great to have someone to run with and I’m happy we got to push each other out there. Let’s keep logging the miles on Strava and chasing fast times! To my coach and partner Steve Weiler: thank you for your guidance, your patience, and your support. It has been a team effort over the past five years and this fall we absolutely nailed it. To my sponsors, Runners’ Choice and New Balance, thank you for your support. I have learned some tough lessons this year and one of them is that you can measure loyalty by how someone treats you when things aren’t going well. Brian Hagemeier of Runners’ Choice and Dave Korell of New Balance have been incredibly supportive through the good and the bad. Thanks to both of you for your continued support. Finally, thanks to all of my family and friends who wished me well before the race, cheered me on or followed my splits and progress during the race, and congratulated me afterwards. I was definitely feeling the love on race day! Dad, Alison, and Will: it was awesome to see you out on the course, thanks for spending a cold Sunday morning outside on my behalf! Strava activity: things got weird downtown but the manual 5k splits I took should be right! The Time is NOW – Discover your Potential! Welcome to the new Runners’ Choice website and blog.